How we got our first customers online. Case Study. This 2 years’ case study, from a B2B small digital marketing agency, is addressed to B2B small business owners. This case study is about how MSalesLeads, a new B2B small digital marketing agency in Miami, obtained its first 7 customers online, and its first 40 qualified leads online, during its first 2 years in business, with a content marketing strategy, and a digital advertising strategy. 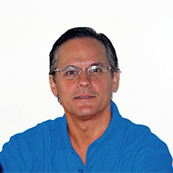 I had a digital marketing agency in Venezuela during 13 years, from 2002 until 2015, named Empresa Web. I had to close the agency in 2015 due to Venezuela political, social, and economic condition. 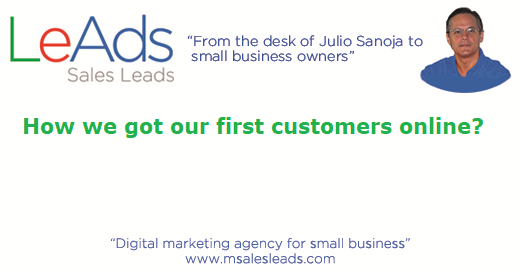 Then, in 2015, I opened a new digital marketing agency in Miami, Florida, named MSalesLeads. I, once again, had to start a new business from zero, and this time, in a new country, knowing nobody, and in a different language. New business, new country, different language, and knowing nobody. The only asset I had was the 13 years of experience with my previous digital marketing agency in Venezuela and 130 digital marketing projects and campaigns executed succesfully. I will begin with the end, and I will show you the digital marketing metrics we have obtained so far in 2 years in business, with a content marketing strategy and a digital advertising strategy. All these metrics have been obtained with only online content marketing and online advertising strategies. Everything has been done online. We have not done any physical marketing, advertising, or selling. This is to show B2B small business owners that they can get their prospects and customers online too. Customers sources: Google search, LinkedIn search, LinkedIn Sponsored Content Ads, LinkedIn Profinder. Qualified prospects: 70 qualified prospects. Qualified prospects sources: Google search, LinkedIn search, email marketing, LinkedIn Sponsored Content Ads, LinkedIn Profinder. Blog articles: 252 articles written, published, and distributed. Google Analytics (average per month): 1,154 sessions, 539 users, 1.39 pages per session, 0:43 minutes per session. Featured in the media: Our agency, MSalesLeads, has been featured at Upcity, Expertise, CV Magazine, Medium Daily Digest, and Voyage MIA magazine. We designed and keep executing a content marketing strategy that consists in the production and distribution of relevant articles about our services and customer needs, in order to gain authority and trust in front of our prospects, customers, and Google algorithm. All above metrics have been obtained thanks to this content marketing strategy. So far, we have written, published, and distributed 220 articles during these past 2 years. Recently, we have also done some digital advertising campaigns at LinkedIn. A good digital advertising campaign at LinkedIn and Google AdWords search can give a B2B small business qualified leads in the short term, and as long as the campaigns are active. A good content marketing campaign can give a B2B small business qualified leads in the mid and long term, in a permanent manner, as long as the campaign is active. Articles must be published at the WordPress blog, and they also must be distributed at all owned media, such as social network business pages, social networks communities and group pages, email marketing subscribers, guest blog pages. All Google marketing products, Google website performance tests, and Google webmaster, SEO, and links guidelines must be implemented in order to rank well at Google search results. Content marketing works for B2B small businesses. Content marketing can be used to position a B2B small business in the digital media and Internet. B2B small businesses will always be found, seen, and remembered by their customers and prospects if they execute a content marketing strategy through the production and distribution of relevant articles about their products, services and customer’s needs. This content marketing strategy takes time to give results, from 1 to 2 years. This is why we recommend to execute an advertising campaign during the first 2 years also, specifically at Google AdWords search, and at LinkedIn Sponsored Content Ads. Content marketing (articles) for mid and long term results. Advertising campaigns at Google AdWords search and LinkedIn Sponsored Content Ads for the short term results. This article was written by Julio Sanoja Rial, owner, founder and digital marketing consultant at MSalesLeads, a digital marketing agency for B2B small businesses. We help B2B small businesses to go and grow their businesses online. We help B2B small businesses to get qualified sales leads and new customers online.